Too many of my clients are “staying away from carbs.” One woman, an Ironman triathlete, was trying to train on a diet based on protein powder, almond butter, egg whites, and chicken, with a few spinach salads and apples on the side. No wonder she was struggling to complete her workouts! Her diet was short on wholesome grains that can easily fuel her muscles and help her perform at a high level. The definition of that “enemy” carbohydrate varies from runner to runner. For some runners, carbs means bagels, bread, and pasta. For others, carbs means any food made with white flour and sugar. For me, carbs includes grains, fruits, vegetables and all forms of sugars and starches. These all digest into glucose, feed the brain, and get stored as glycogen in the muscles. If you eat too few carbs, your muscles will feel needlessly fatigued. As I mentioned in last month’s Carbohydrate Confusion article, some popular diet books (including The Paleo Diet, Grain Brain, and Wheat Belly) have convinced many runners to avoid carbohydrate-rich foods. 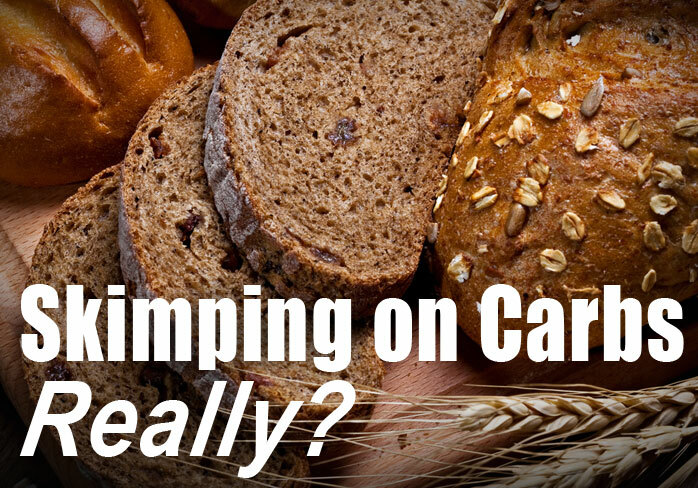 The authors paint the picture that carbs are inflammatory, fattening, and bad for you. Their hype fails to clearly explain that the anti-carb message is not appropriate for athletes who are lean, fit & healthy. The carbs-are-bad messages are targeted to the masses of overfat, sedentary people who consume excessive amounts of calories, often from sweets and treats. For those unfit (often unhealthy) people, excess carbohydrate can contribute to elevated blood glucose, which triggers the body to secrete extra insulin. Consistently high insulin can be inflammatory and lead to nasty health problems. Yet, well-trained runners can handle carbs with far less insulin than the average Americanand without carbs causing “sugar crashes” or weight gain. So what does this recommendation look like in terms of food? For a 150-lb runner who trains hard an hour a day and remains somewhat active the rest of the day (that is, does more than just sit in front of a computer for 8 hours), this comes to 375 to 450 grams of carbohydrate per day, the equivalent of 1,500 to 1,800 calories of carbs. This is more than a few blueberries, a spinach salad, and a pile of broccoli! If these meals look “fattening” to you, please notice the lack of snacking before and after dinner on crackers or sweets. Nor are there food binges every three days when the runner succumbs to devouring the whole bag of cookies. This plan offers a hefty dose of carbs and calories throughout the active part of the athlete's day, when the body needs the fuel. Alternatively, you could heap a whole cup of chickpeas on top of the greens. Either way, you end up with a pile of food that is time consuming to eat if you are a busy runner. + 2 c cooked kale (15 g) + 8 spears broccoli (24 g). Wholesome grains have a helpful role in a sports diet. While fruits and veggies offer some carbs, you need to eat lots of them to compensate for lack of grains. Your efforts to eat healthfully might end up contributing to a sports diet that fails to support your hard training. Please, fuel wisely! Boston-area sports nutritionist Nancy Clark, MS, RD counsels both casual and competitive athletes. Her office is in Newton, MA (617-795-1875). For information about her best-selling Sports Nutrition Guidebook (new 5th edition) and her Food Guide for Marathoners, see www.nancyclarkrd.com. For online education with CEUs, see www.sportsnutritionworkshop.com.